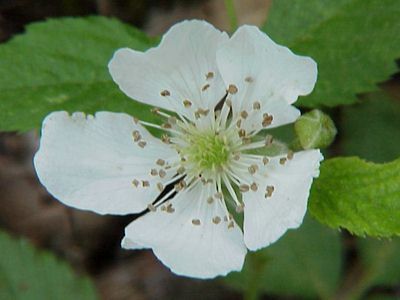 Description: This is a ground runner also know as the low bush blackberry. All plants in the genus Rubus are woody, prickly (very prickly) or bristle shrubs or in this case ground runners. Flowers in singles not like the black berry that flowers in clusters. Fruits are tasty when ripe, I might add they have to be "dead ripe" for sweetness. Good for making preserves or jellies even pies.